Fans of popstar princess Sarah Geronimo has nothing to worry about because her medical condition is not that serious. They got worried when Sarah chose to pullout to a music festival because of health issues. She was supposed to perform at the MTV Music Evolution with James Reid, Nadine Lustre, and One Republic. The organizer of the event, MTV Asia officially announced Sarah’s pullout among the list of performers weeks before the actual show. Before that, she also did not return as a judge to the 3rd season of The Voice Kids Philippines. 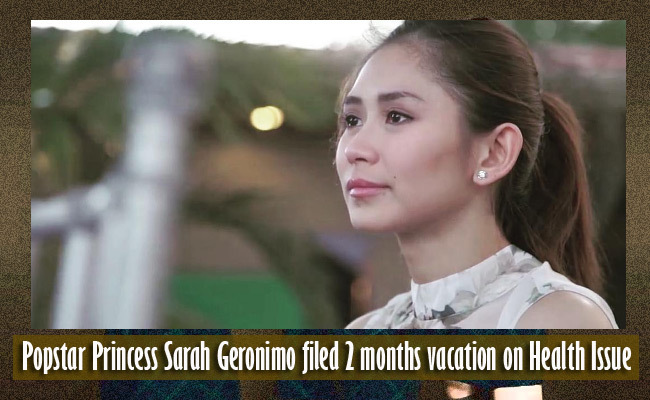 Sarah broke her silence on her interview with ABS-CBN News to set the record straight regarding her health. She revealed that she is okay and she just need to improve her health by having more attention to where she has some difficulty. She didn’t elaborate more details but she revealed that she will have a vacation at the month of July until August to relax. She also hope that when she returns, she will do more tv and movie projects. Sarah then revealed she misses her The Voice family and she is hopeful to be a judge again on its next season. She also praised her replacement on the hit reality show Megastar Sharon Cuneta who was a breath of fresh air on the show as one of the mentors. Sarah stated that she enjoyed watching the few episodes of The Voice and she is glad that Sharon is enjoying the fun experience where the megastar was natural on interacting with kids. She also revealed that audiences finally see the youthful and funny side of the Megastar who previously was also a judge to another hit reality show “Your Face Sounds Familiar”. She is joined by previous judges Lea Salonga and Bamboo Manalac whose protégée was hailed the grand winner of The Voice Kids Season 2.